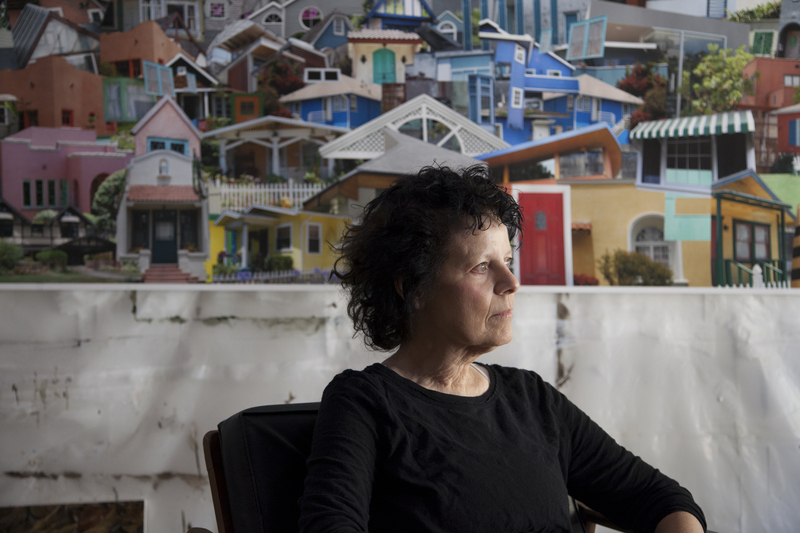 Artist Constance Mallinson in her studio, with one of her artworks in the background. We invite you to the first in a series of Source posts providing a behind-the-scenes look at the artwork fabrication process for each of the seven new Metro Rail stations under construction along the second phase of the Expo Line between Culver City and downtown Santa Monica. The artworks will create a welcoming environment for future riders and connect the stations to surrounding neighborhoods. Artists include Constance Mallinson, Shizu Saldamando, Abel Alejandre, Susan Logoreci, Nzuji de Magalhães, Carmen Argote, and Judithe Hernandez. First up is the work of Los Angeles-based artist Constance Mallinson, which will be featured at 26th St/Bergamot Station. The station is adjacent to Bergamot Station, home to art galleries and the Santa Monica Museum of Art. Mallinson’s mixed media work, Local Color, consists of 24 large scale overhead panels and is being translated into porcelain enamel steel. Porcelain enamel steel is a highly durable material often used in transit environments as well as national parks and other outdoor locations. Because of its durable properties, the material was used in ancient Egypt on pottery, stone and jewelry, and in modern times is used on on everyday objects like cookware, dishwashers and washing machines. Mallinson is integrally involved in the process to ensure the porcelain enamel work matches the color and hue of her original paintings. Click here for more information about the artist and here about her work for 26th St/Bergamot Station. 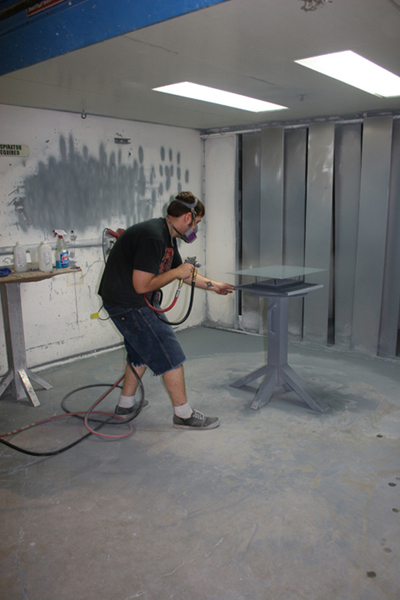 Winsor Fireform technician spraying porcelain enamel on an artwork panel. Photo credit: Winsor Fireform. 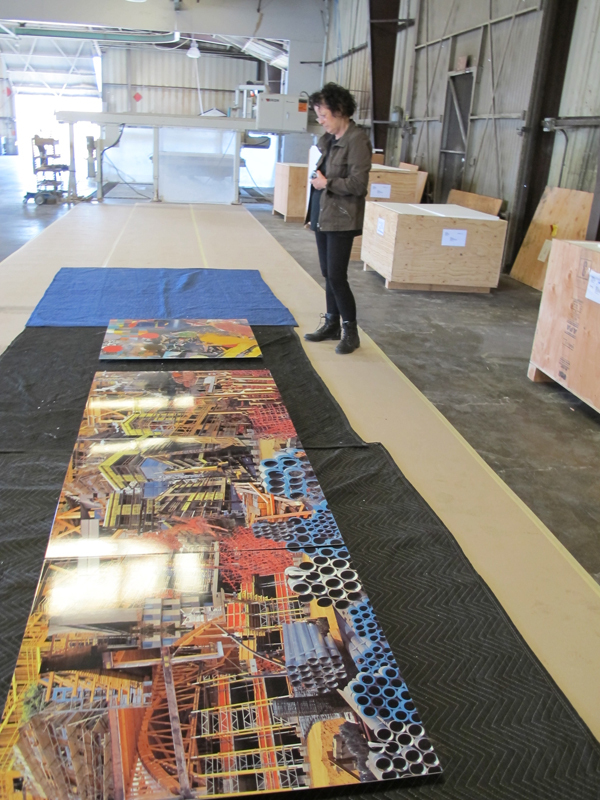 Two of the artwork panels at the fabrication shop – one depicting the urban fabric and the other of flora found in Santa Monica. 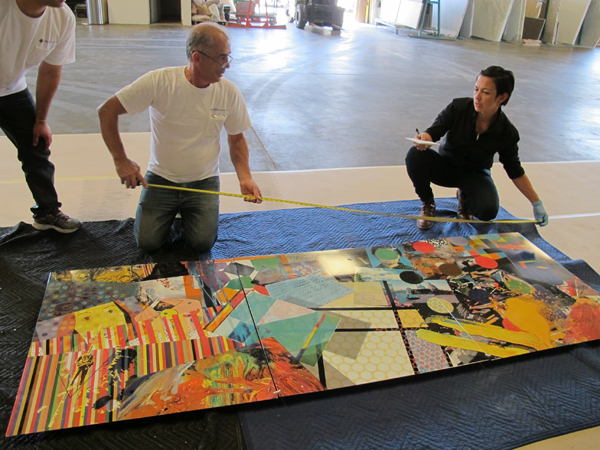 Constance Mallinson inspecting one of her artwork panels after it was delivered by the fabricator to ensure that the colors of her original artwork are accurately reflected in porcelain enamel steel and that the color is consistent among all of the panels. 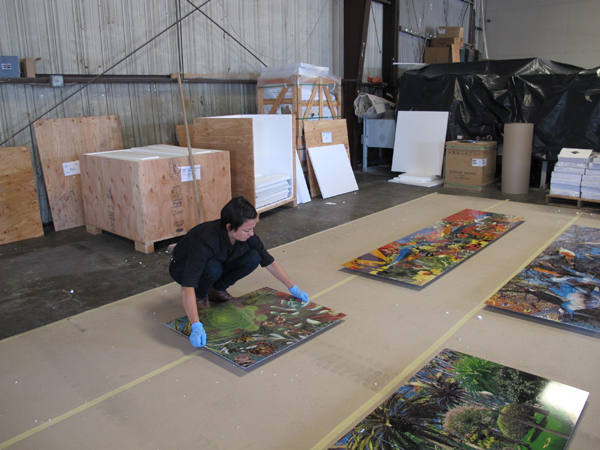 Metro Art Manager Angelene Campuzano carefully reviews each of the artwork panels received from the fabricator.